As reported elsewhere on this site, BNSF struck a haulage agreement with UP that sees interchange traffic between the McCloud Railway Company and BNSF handled by UP between Mt. Shasta City, CA and Klamath Falls, OR. 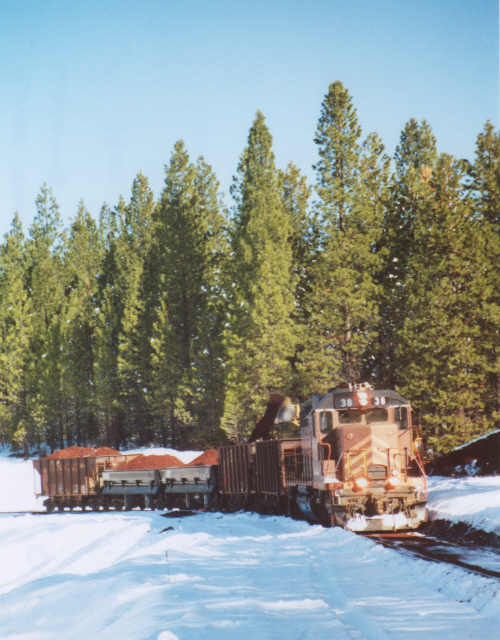 This traffic had previously been interchanged directly between the two roads at Lookout Junction, CA, over the Lookout Line, which stretched approximately 47 miles from a connection with the McCloud's McCloud-Burney main line at Bartle to the BNSF connection at Lookout Junction. 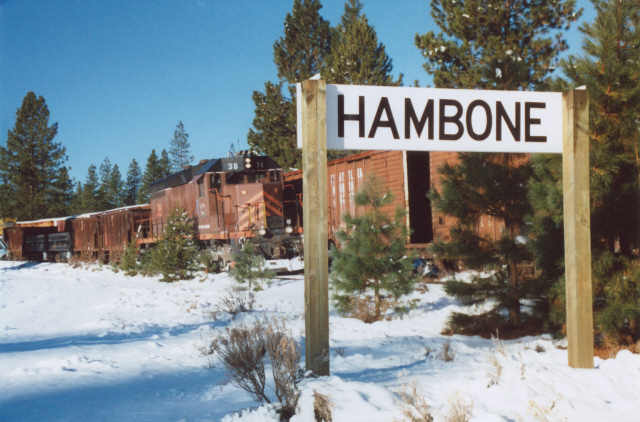 The first 13 miles of this line from Bartle to Hambone were owned by the McCloud, while the balance of 34 miles (Hambone-Lookout) was owned by BNSF and operated by the McCloud under contract in accordance with an agreement reached between the Great Northern and McCloud River railroads when the connection was established back in 1931. Traffic handled over this line had fallen to an average of less than six cars a week in the last five or so years of operation, and both of the railroads involved wanted out of what had become a losing situation. The haulage agreement ended operations over the line, and the last freight to Lookout and return ran on 16 December 2003. BNSF filed an exemption seeking abandonment of their portion of the line (Hambone-Lookout) with the STB on 3 May 2004. STB issued a decision granting approval for the abandonment on 21 May 2004. Rails to Trails Conservancy filed an appeal and offer to assume financial responsibility on 1 June 2004. BNSF did not object to issuance of a Notice of Interim Trails Use, and as a result STB re-opened the proceedings on 21 June 2004, giving BNSF and the Rails to Trails Conservancy 180 days to negotiate for trail use. This period ended on 19 December 2004. So far there have been no further filings in this case submitted to the STB. 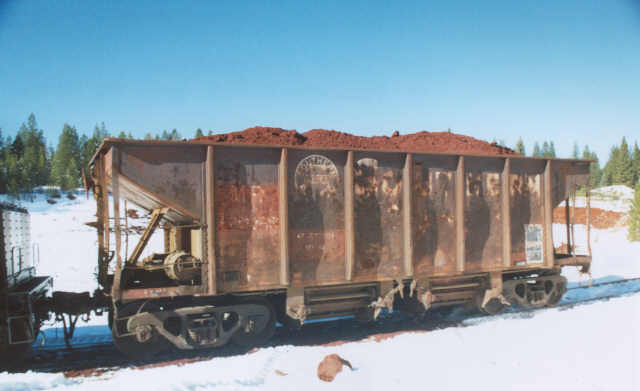 The McCloud had obtained nearly all ballast material used on the railroad from a large cinder pit at Porcupine, which is on the Hambone-Lookout segment of the line. BNSF informed the McCloud that they planned to remove a short section of track at Hambone on Monday 29 November. As a result of this, what should be the last McCloud train ever run east of Hambone operated on Sunday, 28 November. The train was a work extra, consisting of EMD SD38 #38, three of the railroad's four ex-SP bottom dump ballast hoppers, the railroad's two ex-Department of Defense air-operated side dump hoppers, and McCloud equipment transport flat #821 carrying a Cat 966 loader. 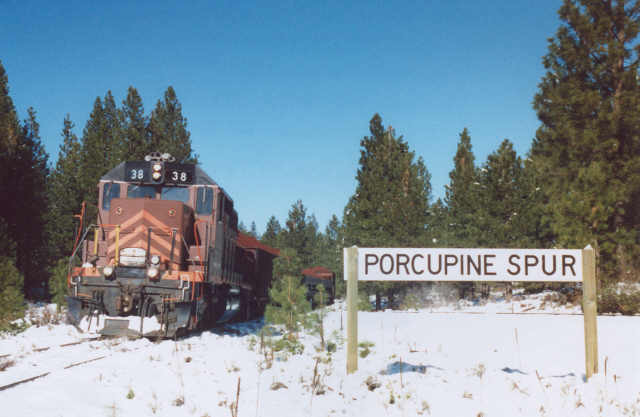 The train ran McCloud to the Porcupine pit, where the hoppers were loaded. The train then backed down the line to Bartle, where it turned on the wye and returned to McCloud. 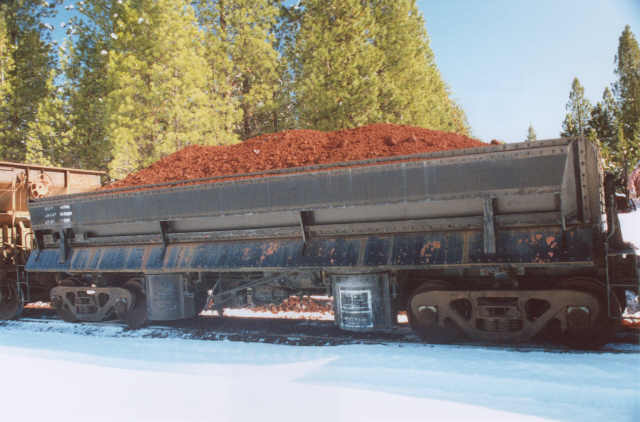 This was the first ballast removed from the pit by the railroad in almost three years, and the fourth bottom dump hopper is still sitting in McCloud, with a three year old load of ballast. The following photos were taken by Roger Titus during this final trip to Porcupine and are used here with permission. Roger was the conductor, and the engineer was Michael Zetocha. The last train to Porcupine is seen picking up some empty ballast hoppers from Bartle Siding. The last train drifting through Hambone. 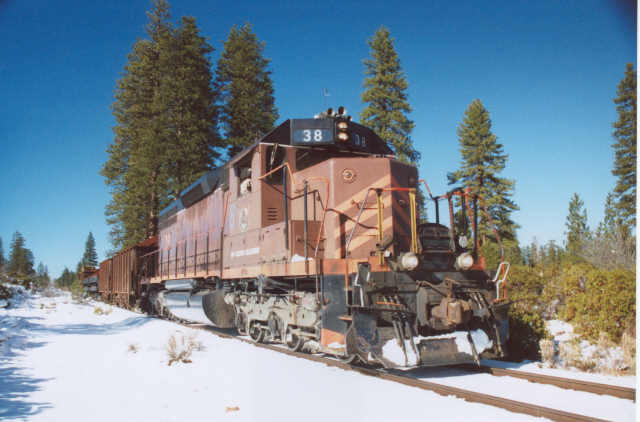 The Hambone siding is filled with ex-McCloud River boxcars now owned by a subsidiary of GE Capital. Upon arrival at Porcupine, flat #821 was cut off of the train and left on the mainline. 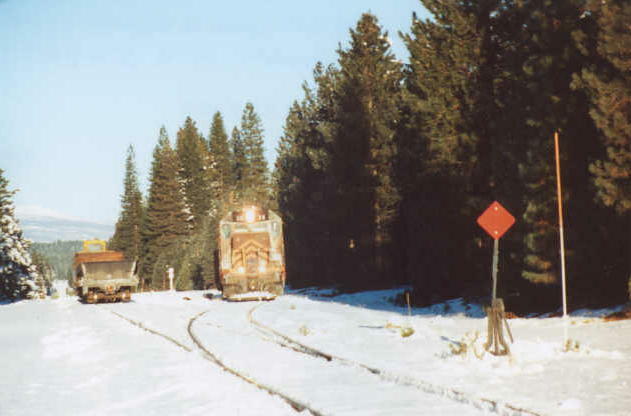 The Cat 966 loader was used to clear accumulated snow off of the spur, and the train was then run engine first into the spur. The loader is seen here dumping cinders into the empty hoppers. One of the two air operated side dump hoppers (MR #1910 or #????) that the railroad purchased from the Department of Defense around 2000. Perhaps one of the last carload of cinders ever to be loaded at the Porcupine Pit. The mining of cinders for use as ballast at this location started around 1931 after core samples showed that a small butte adjacent to the railroad contained vast quantities of volcanic cinders suitable for ballast. Cinders from this pit served as the initial material used to ballast the extension of the Great Northern railroad south from Klamath Falls, and virtually all ballast material used on the McCloud in the past 70-plus years has come from this source. This is one of the railroad's four ex-Southern Pacific bottom dump ballast hoppers (MR #1901- 1904). Time has done a good job erasing the McCloud number from the side of the car. With the loading complete, the #38 backs the loaded cars out the spur and back onto the mainline. The 966 is re-loaded onto the flatcar, the flatcar is re-coupled to the train, and the process of backing the train 23 miles back to Bartle begins. One more shot of the train backing out of Porcupine spur. 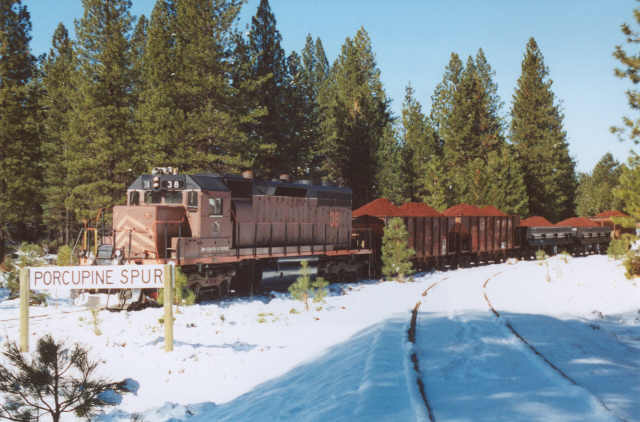 The snow covered rails in the forground once took McCloud trains eastward to Lakin, Camp Two, White Horse, and Lookout Junction. Almost back on home rails. The #38 is seen here shoving the train less than a mile from Hambone, and the McCloud is about to wrap up 73 years of operations east of Hambone.